Does your child scream and protest when it comes time to visit the dentist or doctor? Is a simple check-up or vaccination turn into a full blown melt-down? Here are a few tips to make your next trip to the doctor or dentists office a lot easier! Finding a good doctor for our kids is not always that easy. There may be many to choose from….but then again there may be none who are taking on new patients. If you are able to choose make sure YOU feel comfortable with the doctor. Use your gut! Finding a doctor or dentist who is friendly, patient and compassionate will go a long way. When preparing for your child’s appointment…. talk about what will happen. Tell them the reason they are going to see the doctor/dentist and what will be done or checked. If it is a well-child visit explain that the doctor will check their ears, eyes, find out how much they weigh. Or if it is for a special condition explain what will happen. This is also the time to address any fears that your child might have. Listen to what they have to say and stay patient and compassionate with them. They are afraid of the unknown, or pain, or that you will not be there with them. Let them know you will be with them the whole time and that if there is pain you are right there with them to deal with it. There are so many great TV shows that address going to the doctor and books you can read. You can also get a doctor set and role play what will happen during their appointment. Let your child be the doctor and check you. A fun way to get them ready for their appointment and understand that there is nothing to be afraid of. Be very truthful with it comes to the doctor or dentist. You don’t want to use the doctor to scare your kids into doing or not doing things. Instead of telling them “if you don’t eat that fruit you’re going to end up in the doctors office” say “make sure to eat all your good food so that you grow nice and strong and your tummy works well”. 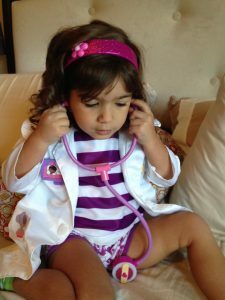 We have a tendency to scare our kids into doing things by using the FEAR of the doctor. This is why when it comes time to see the doctor they are afraid. On the day of the doctors appointment make sure to take snacks, books or some toys to distract them from being nervous. Explain exactly what will happen….. “We will drive to the doctor, wait in the waiting room, see the doctor and then after we will go see a movie together”. In the doctors office provide comfort and control. If you’re nervous your child will be nervous as well. You want to be calm so that they stay calm. If they’re freaking out…let the doctor check your child while they sit on your lap. Control is one of the main reasons why many kids freak out during uncomfortable situations. They feel that they have no choice or power. Giving them the power to choose which ear the doctor will check first or which arm the vaccination will go in will let them feel they are in control. Once the appointment is over…. no matter what happened good or bad follow through on your plan for a special treat. A movie, ice cream or a mini excursion. Ending the appointment on a positive note will surely make the overall experience a good one. Recall the fun or more positive moments in the visit and the treat after. And then hopefully next time your child has a doctor or dentist appointment it will be a lot easier! You can also check out the Mom Talk segment I did on Breakfast Television Montreal.